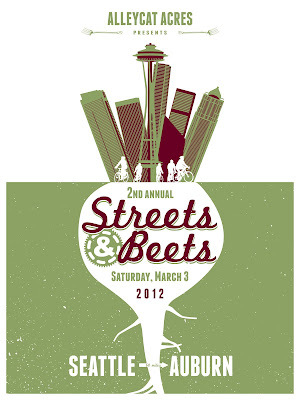 This is a poster I did for the Second Annual Streets and Beets charity ride to support Seattle's own Alleycat Acres. It was a fun project to work on as they pretty much gave me free reign. They are selling prints through Ltd|Gallery in Seattle. 50% of proceeds from the sale of this print will go directly towards Alleycat Acres. Its really beautifull....i have always appreciated the colour schemes u use in your posters.